Part pop-culture examination, part personal journal and part hypothesis, Jessica Robinson’s non-fiction book uses the undead as a metaphor to explore real-world fears that could lead to a possible Zombie Apocalypse! 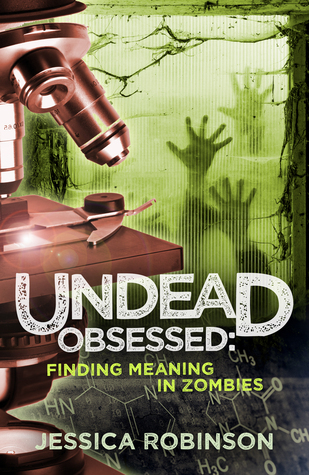 Undead Obsessed: Finding Meaning in Zombies explores just about every possible idea that surrounds Zombies, as a culture. Ms. Robinson examines every ounce of minutia imaginable, from ancient folklore, to Haiti’s Vodou religion, to pop-culture programs, to much, much more. What is a Zombie? An easy definition would be a reanimated corpse. Found in many different cultures throughout the world, Revenants, Nachzehrer, Draugr, Vetala, Jiangshi, Gashadokuro, Ro-langs all share specific characteristics with modern-day Zombies. Reading about each one was informative, as well as entertaining. The book shines when it focuses on the scientific perspective of the genre. Even though science has helped humanity progress by leaps and bounds within the medical field, it also puts the darker side of science under the microscope. While humanity has created medicine to prolong life, it’s also created the fear of the living dead. Zombies are clearly a metaphor for death. Ms. Robinson technically explores the topic as a whole, but the book reads (and feels) like a college student’s thesis, studying every possible perspective of the genre. Once in a while, the author goes off topic and inserts past experiences, making the essays feel more like personal journals. Because of that, the theme feels unbalanced. When discussing Season Two of The Walking Dead, she gets an environmental specialist to discuss possible contaminants affecting Hershel’s Farm, discussing microscopic bacteria contaminating a water source and spreading a disease, similar to that of a Zombie outbreak. That was interesting. When covering the transmission of a disease via microorganisms (and how that could spread a Zombie virus), she gets super technical discussing science, technology and ingenuity. Here, she discusses how any single type of unsanitary condition (including water filtration, wastewater treatment, immune systems, hygiene, etc.) can lead to possible outbreaks. While informative, my eyes begin to glaze over when reading these topics, feeling akin to a school lesson. However, including several topical pictures slightly helped reduce the pain of the lesson at hand. One of my favorite topics that’s covered is the curious CDC preparedness plan for a Zombie outbreak that includes preparation, detection, response and evacuation. The government actually has a plan in place… for Zombies. That never gets old. Once our last line of defense falls (hygiene, immune systems, endocrine disruptors, etc.) disease, death, destruction (and possibly Zombies) looms ever closer. As a whole, the book features multiple essays exploring the worst-case scenarios of an outbreak, be it the Black Death, Spanish Flu, malaria or even the Zombie Apocalypse. Ms. Robinson attempts to answer the question: What if science fails to keep us alive? What’s the worst-case scenario? She offers many possibilities. Wading through the 226-page book takes a lot of time and effort, which is why I had to read it in multiple installments. Even then, I couldn’t finish it. While I’m not exactly the target audience for this book, it feels like required reading for a college professor or a Science magazine submission editor. Having already seen so many of the pop-culture Zombies, I don’t feel like she brings many new ideas to that table, but I do appreciate her hard work studying the scientific perspective of it all. Including real-world experts really helped Ms. Robinson’s case, even if they didn’t believe a Zombie Apocalypse was possible… although they might not have shared all their deep, dark scientific secrets with her. Weakness: The pop-culture aspect of the genre didn’t offer a new perspective. WTF Moment: Reading this book felt like a homework assignment instead of entertainment.